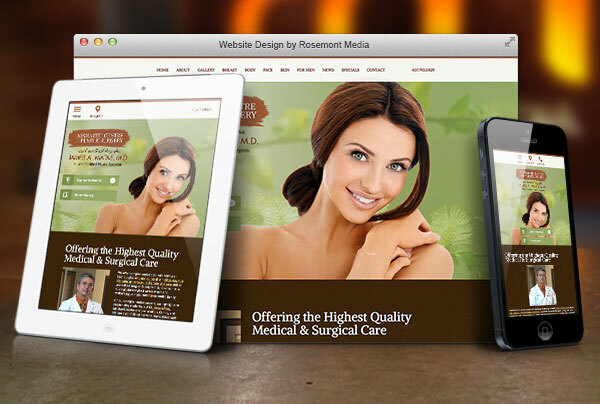 In an effort to enhance his practice’s online viewing experience, Orlando plastic surgeon James Matas, MD recently teamed up with Rosemont Media to create a new responsive website design for the Advanced Centre for Plastic Surgery. The innovative adaptable format allows visitors to more easily discover the medical information they are seeking while utilizing mobile devices. Equipped with an aesthetically pleasing layout that mirrors the welcoming feel of the practice, as well as an abundance of procedural content, the site can now more readily cater to current and prospective patients. Seeking to distinguish the website from traditional designs that provide the same visitor experience across all platforms, Dr. Matas opted for an adaptable format that automatically adjusts to fit the screen of any Internet-compatible device, including smart phones, laptops, tablets, and desktop computers. The mobile-friendly layout also features fixed background and parallax scrolling, two of the most popular design elements currently available, as well as the latest in medical SEO strategies, which helps to enhance the practice’s online visibility by encouraging high page ranking on Google, Bing, and Yahoo. As a proponent of exceptional patient care, Dr. Matas is delighted to offer a detailed resource on popular aesthetic procedures, such as breast augmentation, tummy tuck surgery, brow lift, and cosmetic injectables. Additional patient-centered features include a cost analysis and office tour page. He hopes the easily navigable and informative website aids in the education of patients and leads to greater satisfaction with their outcomes. To view an example of one of Rosemont Media’s customized website designs with parallax and fixed background scrolling, please visit www.yournewlook.com.